The Fair Deal is a general store located in the northern half of Bravil. 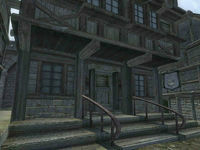 It is found next to Silverhome on the Water and the Fighters Guildhall. The proprietor, Nilawen, has 800 gold and a Mercantile skill of 40. When bartering, she will buy anything but only sells miscellaneous items and the unique Robe of Creativity, which drains your Willpower while fortifying your Intelligence and Personality. Nordinor, another trader, has 400 gold and a Mercantile skill of 30. Although he resides here, he will only be available for business during the night in the alley between the store and Silverhome on the Water. When bartering, he will buy anything but only sells skooma. The store also sells all the upgrades to your house in Bravil. The ground floor contains the main trading room, which consists of a large counter, a dining table and a selection of Nilawen's wares on display. Both she and Nordinor live upstairs, as is usual with Bravil houses and stores. The second floor contains a room with miscellaneous storage and Nordinor's room, which is locked. It contains a lower-class bed that you are free to sleep in. The third floor, which is also locked, contains Nilawen's private quarters, which consists of two beds, although neither is available for sleeping. A handbill advertising the store is listed in the Construction Set, but cannot be found in-game. It would have read: "Looking for a fair deal? Come to the Fair Deal! We won't cheat you, we promise. We buy and sell everything." Esta página foi modificada pela última vez à(s) 03h27min de 9 de agosto de 2013.